New BLOD website on air! New, dynamic logo, contemporary design, cool colors, easy to use, fast and rich in content! The new BLOD website has just been launched, hosting 5179 speakers and 4257 speeches, classified into 37 thematic categories, and enriched daily with new content. Seven years after its first appearance on the internet, BLOD has become a unique electronic platform of knowledge and ideas in Greece, accessible to all and for free. The new site was designed and developed by tool . BLOD is an initiative of the Bodossaki Foundation which aims to disseminate scientific knowledge and intellectual concern through the Internet. Since 2011, BLOD gathers, records and hosts, lectures and speeches, across the spectrum of Greece’s scientific and intellectual life, creating a unique electronic library of knowledge, accessible to all and for free. Up to now, more than 1.800.000 visitors have been browsed on the pages of the site. Starting from the homepage, which includes the post of the day, the latest posts, recent speech events (meetings or conferences with many speeches) and topics to be published in the future, users can explore each one of its 37 thematic categories. Each category includes lectures, related to the main speech, which are accompanied by their slides, documented in explanatory texts, biographical notes of speakers and available literature. In the new website, the transition – through the main menu – to the list of lectures, speakers and event organizers is quick, the appearance of the videos has improved, while following the videos together with their accompanying slides is a lot easier thanks to the new “Full Screen” mode, which allows the visitors to isolate the visual elements from the texts and, if desired, modify the size of the video or slides. Last but not least, effective searching for content through the relevant bar – which is always visible – and the new “advanced search” feature that includes up to 7 different criteria completes the innovations of a highly flexible and efficient new operating environment. 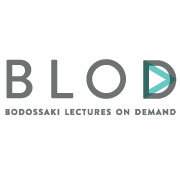 The BLOD’s new website is another step in the Bodossaki Foundation’s effort to contribute to the dissemination of knowledge and to broaden the public’s cognitive horizons, creating a modern online tool, capable of hosting and highlighting the work of organizers of speech events, who have trusted it from the very beginning. Taking into account both the traffic data (1.850.000 visits to date, 1.200 average visits per day, high average users’ time) and the particular characteristics of the website, it seems that it is an effort which has already shaped a loyal audience that is constantly growing.